This Rumble ended on 2002-05-31 00:00:00.0. Love interest: Tika - Master of the fry pan, and adopted daughter of Otik. Battle cry: "Look Raist Bunnies!!" Concerns: Worries that his brother, Raistlin, has more respect for magic than for him. Battle cry: "By the power of Grayskull!" Concerns: Worries that his father, King Randor, has more respect for He-Man than for him. 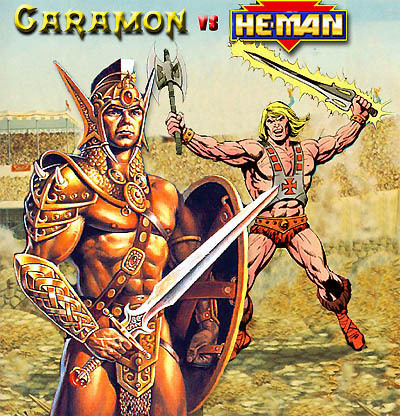 Not many people know this, but during the writing of the Time of the Twins, Weis and Hickman had originally decided to use He-Man for the final battle with Caramon in the Gladiator Arena of Istar. At the time, He-Man was still very popular and they felt it would add a touch of realism to the first major novel since the highly successful Chronicles Trilogy. The editors felt otherwise, finding He-Man to be too powerful for Caramon to handle, so the authors decided to go with a minotaur. It was not as spectacular as they had hoped, but it did the job. I managed to find an excerpt of the text that ended up on “the cutting room floor”, on eBay and willingly paid the $64.78 to obtain it. Now, I will share it with you. The ending to the battle was never written so you will have to decide who wins. At that moment he heard an unmistakable cry above the crowd. “By the power of Grayskull!” He-Man bellowed in challenge. Lighting danced down, running along the form of the warrior. Somehow he looked even larger than before, as if he had been imbued with some sort of monstrous strength that could be seen emanating from him like heat waves. Caramon turned to face him, a look of harsh determination on his face. He-Man lunged with his sword looking to end the fight quickly. But Caramon sidestepped deftly. Raising his foot, he kicked, shattering He-Man's kneecap. It was a painful, crippling blow, and sent He-Man stumbling to the ground. Being no normal man, He-Man agonizingly struggled to his feet and with a deep breath he seemed to suppress the pain. Even though limping on one leg, He-Man’s strength was such that he easily compensated for the painful injury. Slowly the two stalked each other, circling round and round. Caramon no longer heard the crowed that was stamping and whistling and cheering madly at the thought of first blood. He no longer thought of escape, he had no idea-even-where he was. His warrior instincts had taken over, then disaster struck. Caramon, focusing on his opponent, slipped in a pool of slimy red blood, twisting his ankle. His sword flew from his fingers, skidding across the dusty floor of the arena. He-Man grinned and lunged forward to impale Caramon.